Observed at night, exterior of a building in Kitale, Kenya. January 2014. Length, not including legs, about 6 mm. These spiders are well known for their toxic venom which they normally use for subduing prey, but also for defense when attacked. During the day widow spiders remain secluded in a crack or crevice, emerging after dusk to actively monitor their webs. People occasionally encounter these spiders when attempting to clear leaves or debris from inside pipes or other dark spaces. The spider, in this way being crushed, bites in defense. Children or elderly should be concerned and seek medical treatment as soon as possible. Even healthy adults should keep calm and monitor their well being. These spiders prey especially on crawling insects like roaches and termites and thus so long as humans avoid picking them up, they could be considered beneficial for controlling some unwanted insects. 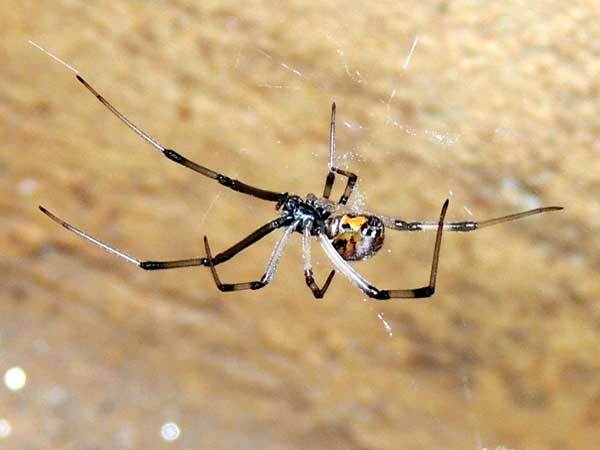 There are several species of Latrodectus described from Africa. Copyright Michael J. Plagens. Page created 22 May 2014.